Rebel in Red: Available now! Cloaked in the same coat of armor it's worn for decades, and equipped with renewed vitality, this custom-built FJ40 Land Cruiser is ready to take its new owner on the ride of their life! If you were expecting a bunch of plastic on the exterior, you won't find that here. What you will find is the same steel frame that was forged on a Toyota assembly line over 35 years ago, perfected and repainted in Freeborn Red. Its classic looks stay true to its roots, while matte silver accents and trail-ready accessories hint at the upgraded capability that lies within. 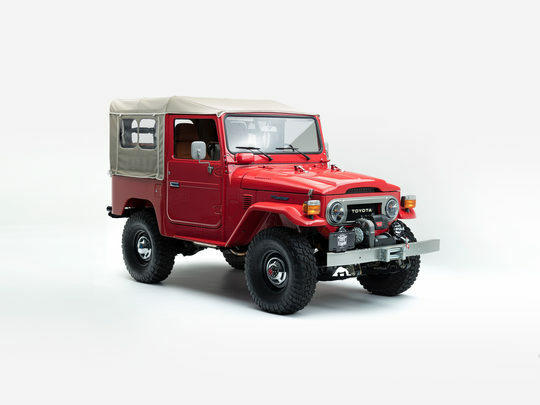 The interior cabin of this FJ40 was made to defy the elements. Marine-grade upholstery adds a layer of protection against wet weather, while the Vintage Air A/C keeps the cabin cool during those summertime adventures. Retro-pull-knobs keep things rustic, while the 6-speaker sound system plays the radio or your favorite playlists — just connect your iPhone or another compatible device. Under all that metal is where it all goes down — where a Toyota 1FZ engine lies in wait. Turn the ignition on, and it roars to life, ready to wreak havoc on the pavement or trail. Smooth shifting and highway coasting come courtesy of a revitalized 5-speed transmission, while the new suspension and Advanced Power Steering keep this powerful 4x4 under the driver's firm control.